The sugary scent of the plump fruit caramelizing in the summer heat was so delicious. The warm air was like syrup. Even the wind gave long slow sighs, relishing its lazy caresses on the soft flesh among the leaves (blushing :-)). The birds flitted around so carefree, plump and content, they happily savored the pick of the crop. The mid-morning light was pale and strong through the low white clouds. Coupled with the sweet scents, it was nearly a tangible haze of spun sugar. There are moments like these when happiness seems easy, within reach, as close and bountiful as bright, sun-warmed fruit. The round fruit, so pleasing to all the senses in that precise moment. I kept thinking back to the other moment before, when they were all just fragile flowers and fine pollen. When their very existence was just a possibility—a speck of dust in the wind. Nearly wordless, invisible. Today I found thick clusters of golden plums and bright red cherries on the same spots where bundles of delicate flowers bloomed in profusion just a few months before. 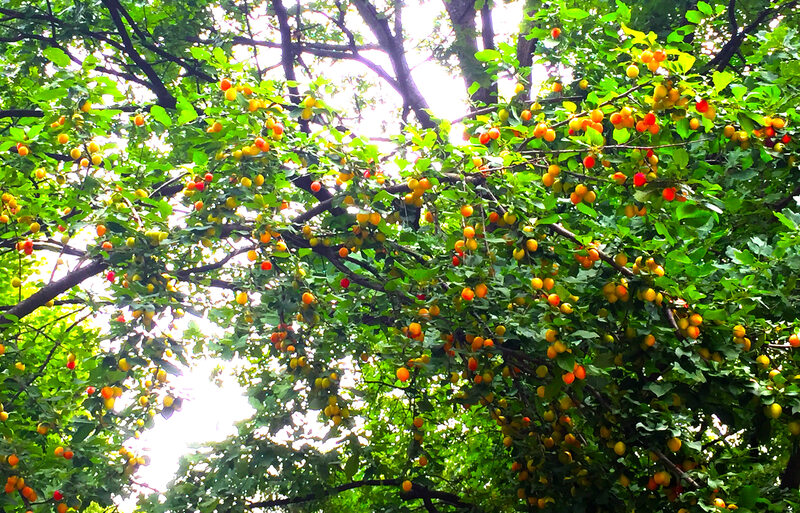 This was a pleasant surprise for me, a city dweller, because most trees in my area do not bear fruit. I realized that the few nearby trees, heavily laden, happened to be the same ones I previously photographed for my “A Snow of Petals” pictorial! The rest of these pictures are not necessarily one to one, meaning they are not exactly of the same trees photographed in the spring and summer, but close, you get the idea. I wanted to echo the look and feel of the blossoms with the fruit.